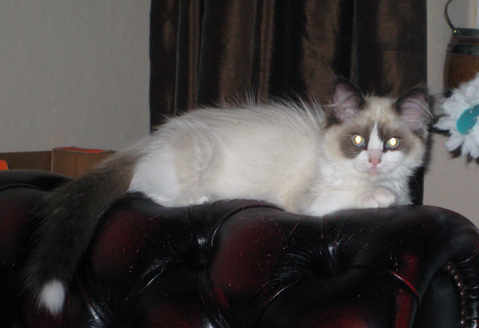 Daisy was without doubt the most beautiful cat I have ever owned. A true Ragdoll and a true lady. She was a very loving girl but did not suffer fools lightly. She knew her own mind and knew how to get her own way. She became a Champion in three consecutive shows and also gained two Grand Challenge certificates. Alas, that third was never to arrive. She was a fantastic mother and produced four beautiful boys - two of whom I have the pleasure of owning. She was put to sleep after suffering a very short illness from which she could never recover and has left a large hole in my heart and a space on my bed. I want to thank Lorraine Swain of Ragamews Ragdolls for the pleasure and honour of owning this beautiful girl. Thank you, Daisy, for sharing your life with me. Dougal came into my life so suddenly and stole my heart with his beautiful deep blue eyes and his handsome looks. A beautiful seal mitted boy that had his own mind and ideas on how he should live his life and always got his own way. Dougal had a very brief but prolific show career. 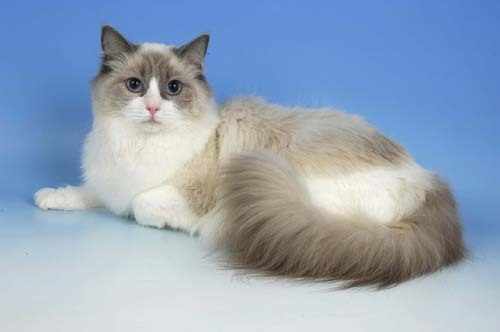 He was the first male mitted Champion in the UK under GCCF rules. 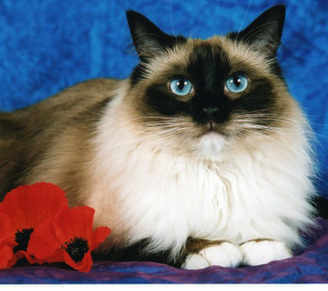 He was the TBRCC mitted Ragdoll of the year for 2002. Dougal was much more than a show cat - he was my soul mate. Together with Willow and Dylan they became the three stoogees. He always had time to tell you a story. If you earned a purr from him you knew you were truly honoured. It was through Dougal that my deep friendship with Sue Allen started. Dougal succumbed to the ravages of chronic renal failure a few days after his ninth birthday. I miss him dearly. I would like to thank Sue Allen of Spiritdancers Ragdolls for letting me own this charming gentleman. Tippy was only with us for such a cruelly short space of time but what a major impact she made on our lives. Tippy lived life in the fast lane. Facing every challenge head on without showing any fear. An amazing character of a cat she seemed larger than life itself. People who met her for only a few minutes seemed to fall under her spell. She had something we cannot put our fingers on. Such a loving little girl with everyone. Most of the time she had a grubby little face and was like a little urchin. I think she did it on purpose just so that she could have it washed with her own flannel. Crystal Tipps was my nickname at primary school after the cartoon character - Tippy already had this name before she came to me so it was destiny that she came to me. She lit up our lives and has left broken hearts. Thankyou, Candice, for letting me have this precious little bundle. Milo is the cat responsible for starting my love affair with the Ragdoll. She was my very first Ragdoll bought in August 1998 as a birthday present to myself. I live on a busy road and had lost another much loved pet, Holly, to the road. 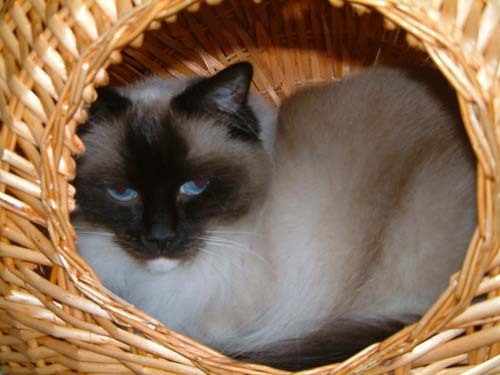 I decided the next cat I had would be an indoor cat and together with my boyfriend we chose the Ragdoll breed. Even though she was not well marked I did take Milo out to some shows and she did have a good degree of sucess but her markings would always prevent her from winning a certificate. I was fully aware of that but wanted to see if I like showing before getting my first show cat. She was a quiet girl and loves her home comforts. Always ready for a one on one fuss and purr . She was a good girl and liked a potter in the garden, like Willow. Milo was 15 years of age when we let her go when cancer had spread through her body. Goodnight, God bless Milo, the landing is a lonely place without you. Thank you to Christine Hodcroft for letting me have my big, woolly, girl.